 Naruto, One Piece, Chobits, Ginga Densetsu Weed, Wolf's Rain, Shaman King, Teenage Mutant Ninja Turtles, Blood, and L O T S M O R E!!!!  drawing, swimming, soccer, television, nintindo, ect.  violin and guitar, that's about it. Hmmmmm... finally i dont have to work now for... *thinks* a whole month!!!! 8D i'm sooo happy cuz i hate working for that -censored- man!! I really do.. he drives me off my -censored- rocker!!! ANYWHOZ yeah i'm getting some down time and staying up till god-knows-when doing absolutely NOTHIN!! WEEE! Well.. *looks at time* it's only 3:30am so the morning is still young.. what to do... hmm..
wellz i guess that's about it.. i think i'll start answering/replying to comments now.. havent done that in a while XDDD!! Yeah, she's been alone for a little while and i'm glad i get to spend some quality time with her and her AMAZING pancakes XDDD!! And yeah, i'm back for good.. that damn VV is completely peeve-ing me off DX i hate it sooo much!! honestly i WISH i didnt know half my family.. majority of them are just drunk red-necks that show up at family reunious just for the free beer and the opritunity to fish in the river while drinking said booze. hmm.. what else.. eh not much i guess lol.. i'm kinda sore from 4wheeling and piggyback riding ppl all afternoon yesturday lol..
mmk i did get me hair cut ^^ it looks good for once too XP everyone seems to like it too. wierd haha. ok i'll put a pic up asap i'm just busy. so yeah XP i hadda dye it yesturday, tis why it's so shiney.. it never looks that good on any other day XP that's CLOSE to my natural color, but not quite there yet.. mom wants it back to my natural color though T~T she said "you cant get it cut if it's that funky purple color!" 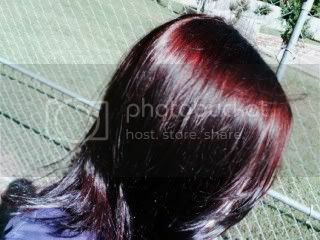 **HINT: yeah my hair WAS purple XP** sooooo yeah, it'll be reddish brown in a couple weeks... BUT AT LEAST I'LL HAVE A PIMPIN HAIRCUT!! 8D!! Thanks for that ^^ i appriciate it! yeah i'd signed your guestbook a looooooooong time ago XP And thanks! We're doing alot better now! YAY! My friend didnt have a bad dream for the last couple of nights so i think everything'll be just fine now ^^ thanks for all the support and what not, i really appriciate it. Oh yeah C= i bought the tickets for the next BLITZ tour!! it reeeeeeeeeeally picked at my pocket but it's worth it!! HAHAHAH! Yeah alot of people havent been on here in quite some time so it's alright^^ and thanks! !